Castle Storm Haven has protected the human kingdom of Holmenstein from the ruthless marauders of the badlands for centuries. But now a dark cloud gathers from the west that threatens to overrun their peaceful lands. 'The Boss', a mysterious figure from unknown origins, has emerged and rallied the treacherous Dark Elves, Giants, Orcs and Goblins of the Green Tide, the ancient guild of magic wielding Arcanists, and the hordes of Undead from the Blacksoot Swamps. The innumerable Dark Force armies have begun their long eastern march towards loot and victory. Knowing the current defenses cannot hold without reinforcements, Holmenstein calls upon new allies: the fearless masters of archery, the Halflings and the armored masters of war the Dwarves. Can this alliance of Fantasy Defenders repel the invaders or will the Dark Forces do the impossible and finally storm the castle? Finally a game where its GOOD to be BAD! 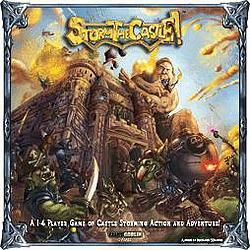 Welcome to world of Storm the Castle!, a 1-4 player semi-cooperative battle board game where you take the exciting role of one of the four marauding Dark Forces armies in a race to breach Castle Storm Haven’s defenses and claim victory by reaching the keep first. Players can choose between 1 of 4 Dark force armies each with their unique units, abilities, and ways of winning. Though they share the same goal of defeating the Fantasy Defenders, players are allowed and encouraged to use treachery, cunning, and steel against their team mates to add in their goal of being the first to enter the castle’s keep. Storm the Castle! is not a heavy war game. Though you have many options each game turn, the rules are easy-to-learn and the game is quick to play. Each turn, players have a wide range of choices to customize how they want to play. Do they buy cheap pawns to throw against the castle walls, devastating siege machines, lumbering giants, strange equipment, or use arcane magic to turn the tides of battle? These choices and more give the game a unique flavor allowing players to try multiple and varied strategies each time the game is played.